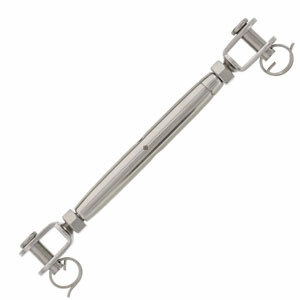 Turnbuckles are made up of a body and 2 end fittings. The inside length of the turnbuckle body determines the length that end fittings can screw in and out. Sizes are referred to by the thread diameter of the end fittings, then by the length that the end fittings can be screwed in and out (also known as the “take-up”). So, a ½” x 12” jaw x eye turnbuckle has end fittings with ½” diameter threads. The take-up would be 12” and one end of the turnbuckle would have a jaw end fitting and the other end would have an eye end fitting. The larger the thread diameter of the end fitting, the more capacity the turnbuckle will have. 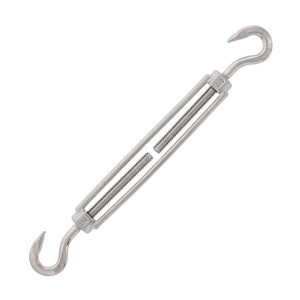 The longer the length of the turnbuckle body, the more slack it can take-up. How a turnbuckle works is to first unscrew the end fittings all the way out and take care not to screw them too far (inside the ends of the turnbuckle body). Then attach each end of the turnbuckle to the work pieces. Be sure that the end fittings cannot turn. Then turn the turnbuckle body. 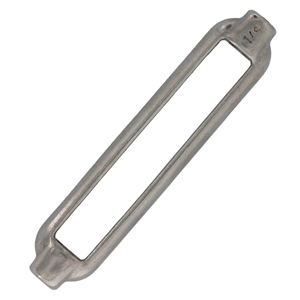 One end fitting has left hand threads and the other has right hand threads. Turning the body will draw both end fittings in simultaneously and tension will be applied. 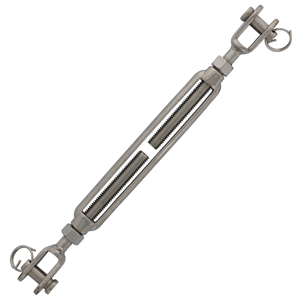 The turnbuckles offered by E-Rigging have drop forged bodies and end fittings. As a protective finish, both the end fittings and body are hot dip galvanized. 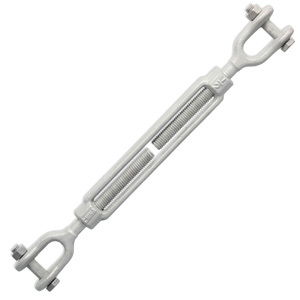 These turnbuckles are also made to conform to U.S. Federal Specification FF-T-791B. 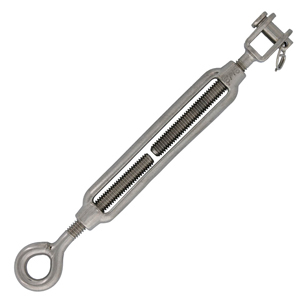 In addition to the industrial carbon steel turnbuckles that are hot dip galvanized, E-Rigging also offers stainless steel turnbuckles with a variety of end fittings and turnbuckle body styles. 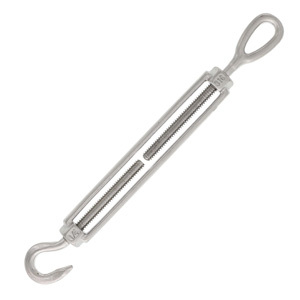 Stainless steel turnbuckles are available with hooks, eyes, jaws and toggles and combinations of each. 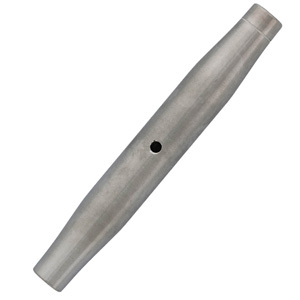 Traditional bodies and architectural pipe style bodied versions are offered as well. All E-Rigging stainless steel turnbuckles are made of type 316 marine grade corrosion resistant stainless steel.